Lev, a marketing technology consultancy that provides implementation, strategy, and support for companies who use Salesforce products is excited to announce their new headquarters in Indianapolis, Ind. The company was previously headquartered in Chandler, Ariz. Additionally, they will add 70 new Indiana based positions in 2019. 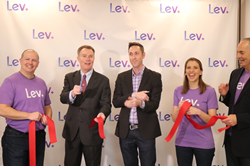 Mayor Joe Hogsett and Lev's CEO Michael Burton cut ribbon at grand opening ceremony. Lev, a marketing technology consultancy that provides implementation, strategy, and support for companies who use Salesforce products is excited to announce their new headquarters in Indianapolis, Ind. The company was previously headquartered in Chandler, Ariz.
Lev welcomed community members including Indianapolis Mayor Joe Hogsett for a ribbon-cutting ceremony and official announcement. The announcement confirmation of Lev’s plans to hire an additional 70 people in 2019. Michael Burton, chief executive officer, was the first Lev employee located in Indianapolis starting in 2016. During that time, Lev has operated out of 5 different office spaces, moves that were motivated by the rapid growth of their local employee base. “It’s exciting to finally move into our Indy home and continue to fulfill our promise to add up to 175 jobs in Indianapolis,” said Burton. Mayor Hogsett also issued a proclamation declaring Feb. 19, 2019 "Lev Day." Lev currently has more than 120 employees across the country, 70 of which are located in central Indiana. A diverse, highly-skilled pool of candidates and rapidly growing tech landscape were two of the many factors that led to their decision to move their headquarters to Indianapolis. For more information on Lev, visit http://www.levdigital.com. Lev is a technology-first consultancy that delivers highly creative customer engagement solutions to customers who use Salesforce products. Founded in 2006 Lev is headquartered in Indianapolis, Ind. and also has offices in Chandler, Ariz., and El Paso, TX. For more information on Lev, visit http://www.levdigital.com and follow the company on LinkedIn, Twitter, and Facebook.